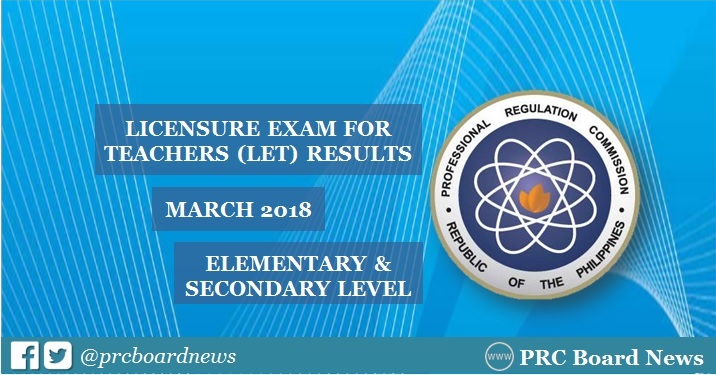 The Professional Regulation Commission (PRC) and the Board for Professional Teachers (BPT) finally released the official results of March 2018 Licensure Exam for Teachers (LET) or teachers board exam in forty (40) working days after the exam. View on this page for the complete list of passers, top 10 (topnotchers), top performing schools and performance of schools. PRC said that 13,774 elementary teachers out of 58,323 examinees (23.62%) and 22,936 secondary teachers out of 76,673 examinees (29.91%) successfully passed the Licensure Examination for Teachers (L.E.T.). It is further announced that of the 13,774 elementary teacher passers, 4,360 are first timers and 9,414 are repeaters. For the secondary teachers, 15,035 passers are first timers and 7,901 are repeaters. Registration for the issuance of Professional Identification Card (ID) and Certificate of Registration will be from June 4 to June 11, 2018 for Elementary Level and June 14 to June 29, 2018 for Secondary Level. PRC reminds successful examinees to PERSONALLY register and sign in the Roster of Registered Professionals. The dates and venues for the oathtaking ceremonies of the new successful examinees in the said examination WILL BE ANNOUNCED LATER, the agency added. March 2018 LET is composed of (2) parts for Elementary — General Education (40%) and Professional Education (60%) — and three (3) parts for Secondary — General Education (20%), Professional Education (40%) and Specialization (40%). Congratulations to our new teachers!